2018 seems to be another year of extremes. We (Rent Mother Nature) had a day in January that was 30F below zero with wind chills taking it down to minus 50, followed by several days in a row well above freezing and melting most all the snow (not a good situation). Sap began to flow spasmodically starting January 20th. Despite that we expect decent maple syrup production results this season, in part due to new technology we are using, wherein buckets have given way to a tubing system that does not expose tap-holes to premature drying. We saw it coming in 1985: maple seasons are starting earlier due to climate change. Over the last 32 years there have been noticeable changes in the weather patterns upon which maple production is totally dependent. Decades prior to 1985 (we have been making maple syrup our farm for more than a century) there were years with extreme fluctuations in temperature, but mostly on the cold side (once down to minus 48F around 1937 as I remember). Such cold is great as it kills invasive insect species and does not harm maple trees as-long-as there is deep snow cover. After 1985 the first successive freezing nights and warm days needed to create the ‘pumping’ action that induces sap flow have started progressively earlier. Tapping too early, followed by a long sub-zero spell, can result in the loss of production as tap-holes dry well before the true season starts. A study was conducted by Boston University on the “Effects of Winter Climate Change on Growing Season Sap Flow and Carbon Exchange in the Northern Hardwood Forests”. The results “…projected reduction in the depth and duration of the winter snowpack leads to a greater depth of soil freezing and increased frequency of soil freeze/thaw cycles…These changes in winter climate tend to reduce rates of sap by red maple (acer rubrum) and sugar maple (acer saccharum) trees at the beginning of the growing season…” In conclusion, “scientists project winter warming in the northeastern United States of about 4 degrees Celsius (39.2F) by the end of the 21st century and a 12-30% increase in winter precipitation, with more falling as rain.” Fortunately we are located near the Canadian border whose freezing temperatures are less apt to be affected. Eastern Canada, by the way, makes 85% or more of the entire world’s maple syrup and is better positioned to maintain this historic North American crop. Sugarbush maintenance is an ongoing activity. This past year we (Rent Mother Nature) once again removed trees that had not fully recovered from a severe ice storm in 1998 that toppled trees and stunted others. This makes room for new growth (which we expect will be ready for tapping around 2058). The timbered trees were processed into woodchips and firewood to feed the massive wood-burning arch that supports huge pans used to boil sap down to syrup. Generally, lumber mills do not like to process wood from sugar bushes for fear that an old metal spile may have accidentally been left in the tree (Expensive saw blades can be ruined in an instant by cutting into one of these old spigots). 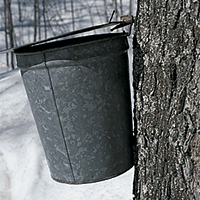 Recent surveys and research on best practices in tapping trees and making syrup concluded that smaller tap holes and plastic spiles hooked to a vacuum pump results in good sap flow and less tree damage. A traditional 7/16th inch tap hole takes about 3 years to heal in a healthy tree. The smaller 3/16th tap hole heals in less than half that time, with reduced chances of insects entering the hole to damage the tree. This is not nostalgic or as scenic and romantic as one might like, but it comes with higher yields and less labor.